I’m thinking of starting a regular feature on this blog called “things I learned in the shop” because it feels like every time I go down there I feel like I learn something new. Which is part of why I do this stuff, I love to keep pushing and challenging myself. I had to trim the bottom of my sliding tray drawer for the Saw Bench Box about a half inch. I thought I could just set my Jack up for a heavy cut, and plane it down quick like. But I soon discovered it was taking way too long. On a lark I reached for a drawknife that I had purchased ages ago and hung on my wall waiting for an appropriate moment to use it. I started pulling along the edge of my board that I had marked with my cutting gauge on all sides (this is important) and the wood came off in very thick shavings, I’m talking 1/4″ or more at a time. It is important to pay attention to the grain (when is it not) because it could easily dive down under my cut line if not careful and grain was not straight. When I neared my cut line, it actually split along my cut on both sides. It took only a few moments to pare down the waste, and a few passes with my bevel up Jack plane to lower the high spots. 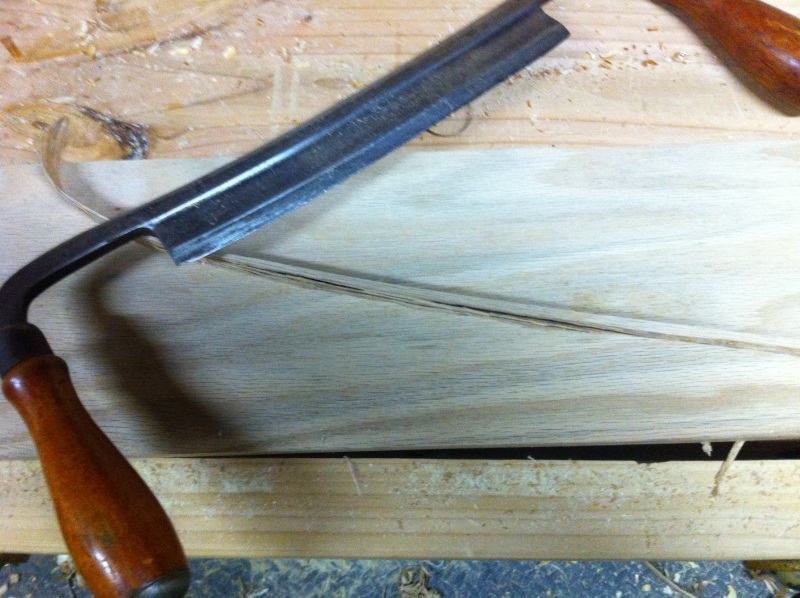 Speaking of Bevel Up, I was using the drawknife in the mode, instead of bevel down. It worked really well, and I think I might use this again before reaching for a saw. Which is ironic because this is a sliding tray for my Saw Box.